Promotors:- Sumit Woods Ltd is leading Developer having projects in Mumbai and Goa, SWL take up mid size Projects. Co Promoted by Mitaram Jangid & Subodh Nemlekar now Second Bhushan Nemlekar (Harvard Graduate) too joined the Business. SWL successfully running the Business since last 30+ Years and delivered over 5000 units spanning over 52 Projects. Real Estate Sector in MMR on revival mode, Mumbai will have World Class infra in next few Years that will attract huge demand going forward. Unsold Inventory is big issue in the Sector but once we analyse the data most of the inventory belongs to large luxury projects and Projects in way far (Locations disadvantage) & Projects stuck due to approvals or Financial reasons. All such inventory having age of over 3 Years hence in normal ongoing projects inventory isn’t that big issue. Since the beginning Co working on Joint Development Projects, Redevelopment Projects, now started getting Projects on Development Management Model. Co provides housing to Mid Income Group. Co adopted Asset Light Business Model since bigining and don’t believe in buying Lands. SWL believe themselves as a huge beneficiary of RERA, SWL believe that they working according to the RERA norms since beginning. Finance Cost is nearly 12-13% which is phenomenal in the segment. Strong inhouse Team to execute the Projects. Disclosure : Invested & willing to add more! I have met with Promotors few times and never let go any opportunity to meet them. 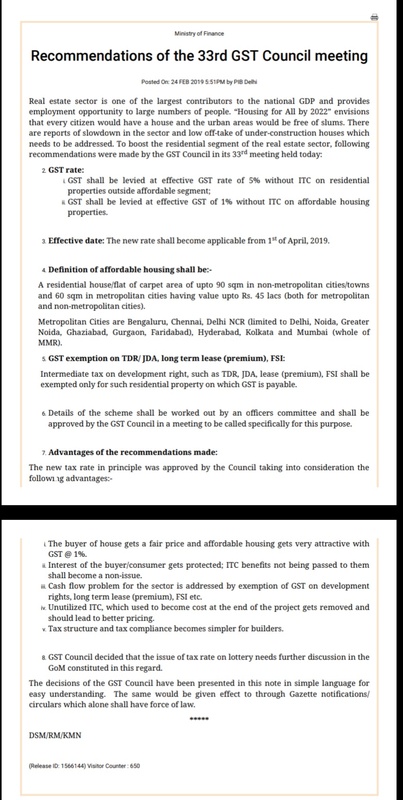 The GST Council has approved lowering the tax rate on under-construction properties to 5 percent, from 12 percent earlier. Can you please share details of the projects that the company is undertaking. The area that it is looking to sell and the realisation that the company expects. Also please share the Debt, profitability status etc. Also, Real Estate Companies are not valued on EPS, but on Asset values. That’s true that Real Estate Cos not valued at EPS. Being Asset Light Business Model SWL don’t buy much Land so valuing it on NAV basis will be very difficult. SWL work on JV Models and Development Management Model so better to value it on expected Cash flow generation. SWL have 8-9 Project’s running out of these 5-6 are self funded which show financial strength of the Co.
Co maintaining around 30% EBITDA and around 20% PAT Margins.